It’s senseless to be “backed into a corner”, or suffer a poor design, for corner base cabinets. The average kitchen has only one and there’s at least six feet of available storage space available. Designed well, the corner base cabinet is an ideal place to store large, clunky and not often used wares. When it comes to deciding what type of base corner cabinet works best, IKEA has two types: a ‘blind‘ corner or a ‘pie cut corner’. 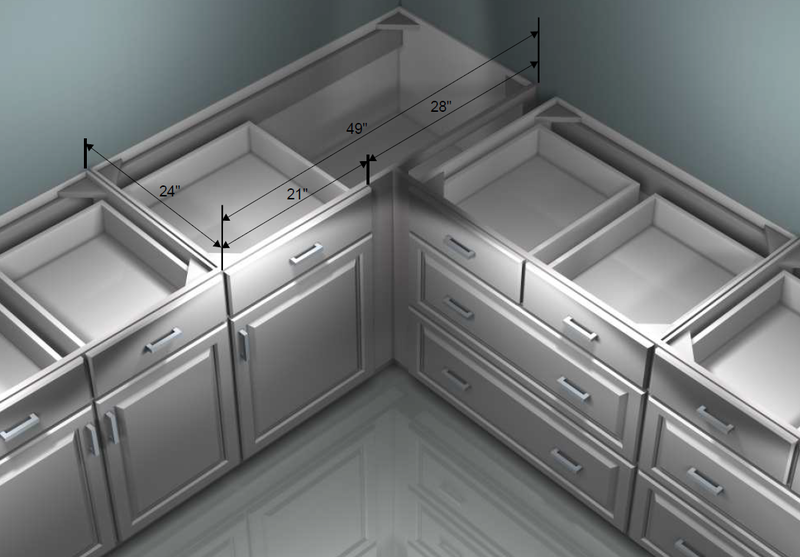 The pie-cut corner cabinets are 37” wide along the back of each of the two sides. They have two doors joined by hinges that form a sort of accordian effect; because the door(s) can be opened completely there’s great access to reach inside. They also come with a carousel (or lazy susan) already installed for even better access. Blind corner cabinets are 49″ wide. The drawer and door are 21″ wide and, once opened, the entire inside 49” is accessible. This cabinet is available in two styles: one with just a shelf inside and the other with a swivel shelf that swings out of the cabinet. Shown below is the hidden space available for storage. The blind’s advantages are its large size as well as the fact that it comes with a drawer. Though, in order to see what’s inside a miner’s helmet may be useful to crouch, peer and search. The swivel shelf is more a comfortable accessory though storage space is sacrificed. A classic battle of space versus comfort. But if the space is too small for a 49″ blind corner cabinet and too big for a 37”x37″ pie cut corner cabinet, there’s a little modification that’ll solve this problem. A 49″ cabinet (without the accessory) is modified by removing the drawer and trimming 4″ inches – leaving a 45″ cabinet; trim 7” for a 42″ cabinet. Use an 18″ or 15″ full height door instead of the 21” door/drawer combo. IKEA sells doors separately, so there is no need to buy an additional cabinet.